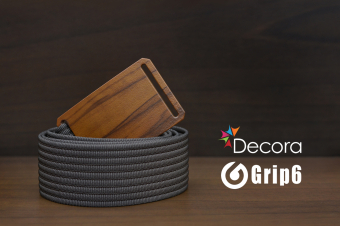 Grip6 is a minimalistic belt with no holes and no belt flap. It's aesthetic design is perfect for anyone looking to stray from chunky belts. When it comes to Grip6, there's no need to sacrifice comfort at the price of fashion, because Grip6 belts use a military spec webbing that has a remarkably strong hold. This means the belt strap has a breaking strength of 2700LBS, which is insanely cool! If you don't take our word for it, try one out for yourself here. 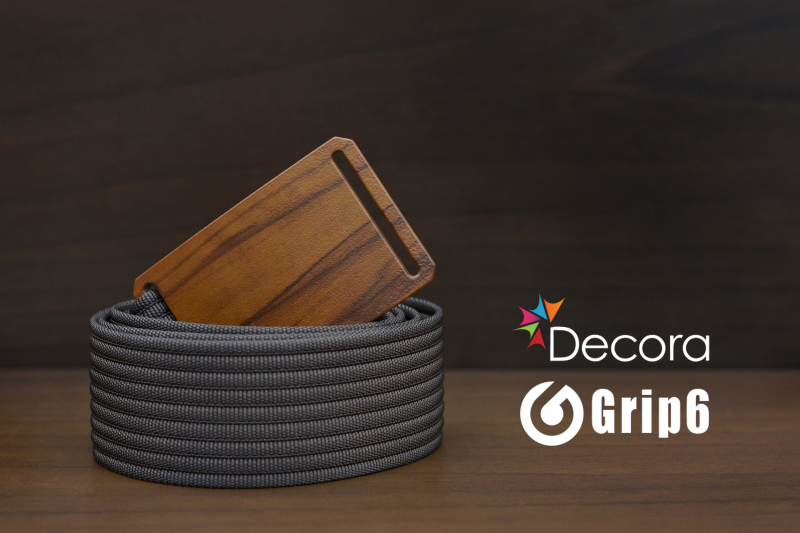 As for the buckles themselves, Decora was happy to play a part in the creative process with our faux wood-grain sublimation. The ability to make something metal look like wood is important in the design world, as it offers a modern twist to an established classic. Seeing the belt buckles go from a silver aluminum, to looking like a completely different substrate (without lacking the durability of the existing product) gave us great satisfaction. First coat of paint, hanging on our new racks. Getting ready to transfer the wood-grain. Sandwiched between our wood-grain films. Belt buckles getting covered to be vacuum sealed. Vacuum sealed, moments before going into the oven. After the oven, ready for the film to come off. Peeling off the wood-grain film. Uncovering the batch of belt buckles. The transfer is complete, check out the film on the right! Decora is happy to offer long-lasting wood-grain finishes for consumer products. Pairing with other businesses offers a great deal of creativity thanks to our sublimation process. The ability to print directly to metal is a valuable skill, and leaves an impression on consumers that they won't forget. Most people print to paper or fabrics, but the ability to print to metal is what can separate yourself from the rest! The endless opportunities are what make sublimation so great. One day we are sublimating our Luxyclad siding, to create sustainable contemporary homes - the next day we are sublimating designs for belts that will be worn by people for years to come. Pushing the boundaries for endless creativity is what we do best. Push the boundaries yourself. We love seeing what our customers can do with our paint and wood-grain finishes, and we would love to feature your product on our Instagram page!